This meal is a great way to use up those odds and ends of veggies leftover. Instead of rice I thought I would use Pad Thai Rice Noodles. I made a batch of the Chinese Brown Sauce that I recently posted for you. I added edamame for protein. Add the veggies and you have a quick and flavorful meal in a flash. 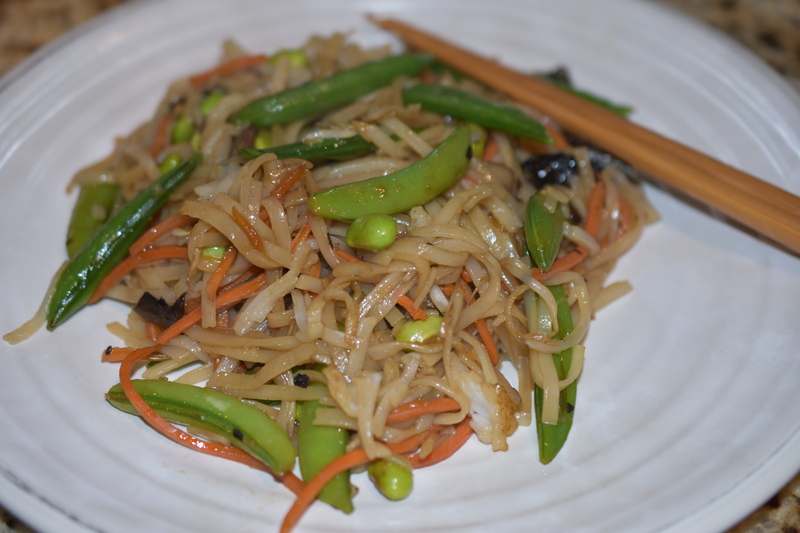 Just like when I made the fried rice I am using a large electric griddle to make the stir-fried noodles and veggies. It is so easy and quick this way. Make up a recipe of the Chinese Brown Sauce, if you do not already have some in your refrigerator. Soak noodles in hot water for 8-10 minutes, until tender. Drain noodles and set aside until needed. Heat griddle to 350 degrees. Grease griddle with oil of choice. Add vegetables (except bean sprouts) and spread out evenly onto griddle. Let the griddle do its work for a (2-3) few minutes. Flip over vegetables like you would a hamburger, until all veggies have been turned over. Add bean sprouts. Let the griddle continue to do its job, about 2-3 minutes. Add noodles and mix with the veggies.Cook about 2 minutes. Pour sauce onto noodle mixture. Stir well. Thank you. It is so quick and easy to make. Thanks for stopping by. It is a favorite in my house.